This hotel with free Wi-Fi is located beside the Deutsche Oper Opera House in Berlin's elegant Charlottenburg district. It is 1.5 km from the Kurfürstendamm boulevard and offers easy access to Berlin's ICC Congress Centre. 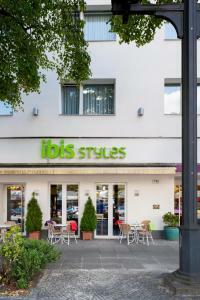 The 3-star-superior Ibis Styles Berlin an der Oper provides cosy rooms with all modern facilities. All rooms include a minibar and a safe. A free internet terminal is available in the lobby. Snacks, drinks and breakfast are served in the Ibis Hotel's welcoming bistro. Deutsche Oper Underground Station is outside the Ibis Styles Berlin. The U2 underground line provides direct connections to Potsdamer Platz Square, the Friedrichstraße shopping street, and Alexanderplatz Square.